Anyone who has run public relations for an organization will tell you that there is always a point of no return for any press conference disaster. Usually it happens sometime in advance of the actual day of the press conference. That point of no return is what immediately comes to mind when you are five minutes from the start and in front of you is a room full of empty seats. Call it a flashback if you will, but you stand there and your mind replays the moment of clarity when you were given every possible warning that this just wasn’t going to work out. Perhaps the most common example goes something like this. You’re going about the business of providing excellent public relations support for your organization, and you are called into a management meeting. Is the subject of this news conference newsworthy outside of our organization? 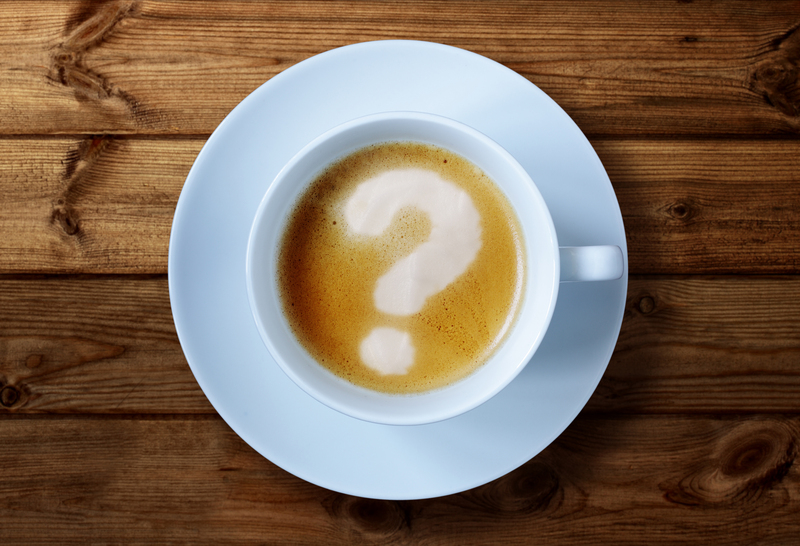 What makes it new, interesting, relevant and timely? Can we get the same results without a press conference? Does this story absolutely require that a reporter sacrifice a half-day or more just to attend the press conference, and then the rest of the day to write the story? Of course, there are many other questions to cover, but they all point to the fundamental issue of whether a press conference is warranted. Click here to sign up for our eNewsletter! The challenge for most public relations chiefs is not to appear as a naysayer when the organization wants to have a news conference. Usually, when the organization gets behind a media relations initiative, that’s inspiration in itself. But this kind of enthusiasm needs to be managed, to be sure. The right balance involves not automatically rejecting the idea of a press conference, while trying to engage in a dialogue on whether the PR tactic is the most effective approach. Two of the more common myths around press conferences is that they in-and-of-themselves generate news. They don’t. Or that the media prefers to get its information in large-group settings. Usually they don’t. Newsrooms are shrinking. That means there are fewer and fewer reporters to go around. Most news organizations require journalists to work on two or more stories per day, which means losing just one reporter to attend a press conference will likely going to drain the newsroom of a valuable resource. Unless you’re coming out with the next iteration of the iPhone, don’t assume the media will make that reporter available. That said, technology does help lean newsroom staffs to gather news more productively. They can conduct interviews by phone, by email, and by video conference. For live press conferences they may prefer to listen from their desks via dial-in access. If you have a press event planned, don’t forget to provide live remote access, which can include audio and video. What visuals can we provide? Do we have any products to show or demonstrate? Can we go on location with the story? Will the background provide a visual to help tell the story? Can we get all of our expert resources in one place at one time? Would it make sense to have the press conference in a location where the media is already on hand like an industry event or trade show? Is the news we’re announcing something already likely to generate a good deal of media interest without a news conference? If so, the chances of media attendance go up significantly. Logistically, will we have trouble responding to reporters on a one-on-one basis? This suggests demand is inherent and attendance is likely. How accessible are our subject matter experts or spokespersons? The unusual nature of having all SMEs together could be a draw, but it’s important to be realistic about whether this is newsworthy. Of course, the standard tools of the media relations trade are press releases and telephone interviews. This is assumed, but usually only a starting point. Depending on the nature of the news, you can offer “test-drives” of the new product, technology or service. Some journalists actually prefer immersive reporting. 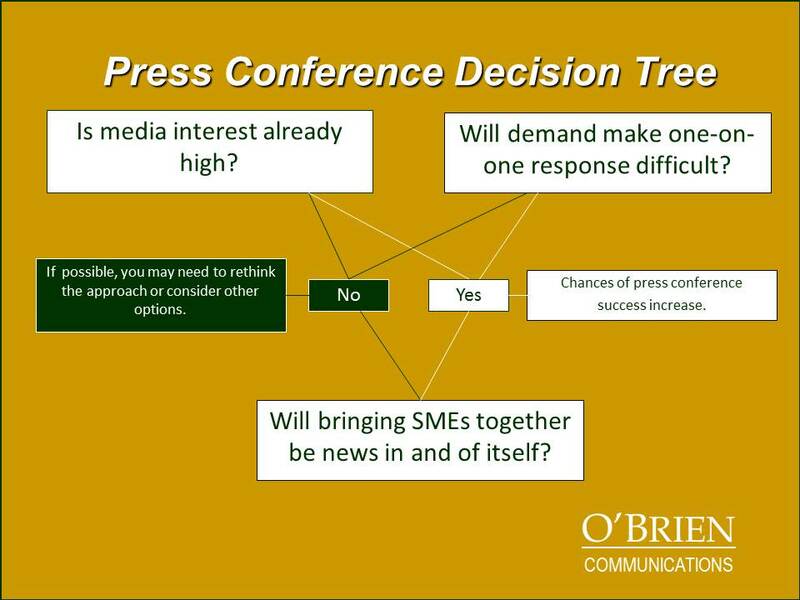 Consider informal media briefings or site tours, which can be one-on-one or with small groups. Instead of a formal press conference, your spokesperson could meets in a round-table format with selected reporters. Regardless of whether the decision to have a press conference is within or beyond your control, the one thing you can do is manage expectations. From the very beginning, take care not to over-promise or guarantee media attendance or outcomes. 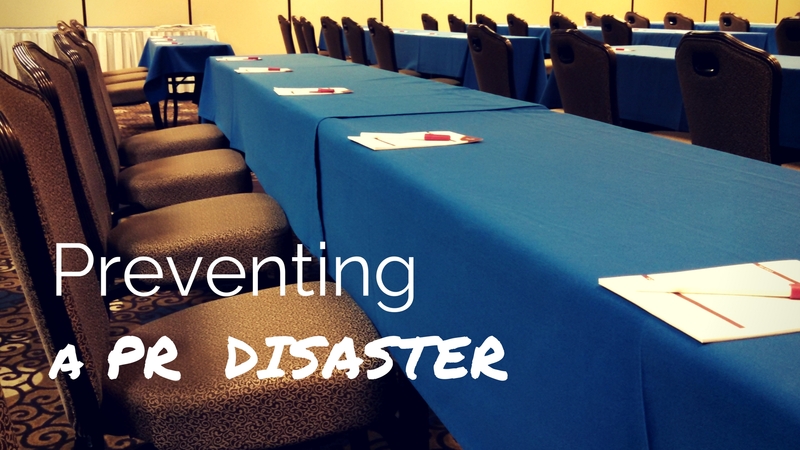 Keep the focus on your process for giving the organization its best chance at coverage. And then make it clear that you and your team are doing everything possible to assure the most positive outcome. If you have any questions about media relations, or any additional thoughts to add, let me know.